Pepperdine faculty, staff, students, alumni, and friends will gather together to celebrate the University’s annual Founder’s Day event at Firestone Fieldhouse in Malibu on Wednesday, September 19, at 10 AM. Declaring the opening of the 2018-2019 academic year, Founder’s Day commemorates the University's early beginnings and honors the vision of its founder, George Pepperdine. The ceremony will commence with an alumni processional and an invocation from Edwin L. Biggers, chair of the Pepperdine University Board of Regents. 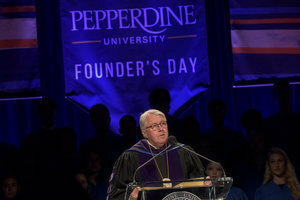 School of Law alumnus and fellow Board of Regents member Terry M. Giles (JD ’74) will deliver George Pepperdine’s 1937 Dedicatory Address, followed by a special message from Pepperdine president Andrew K. Benton. The Pepperdine Symphony Orchestra and University Concert Choir will perform a variety of musical selections, including the National Anthem and the University’s fight song. All Founder’s Day guests are invited to a reception in the Firestone Fieldhouse courtyard following the ceremony. For those unable to attend, the event will be broadcast live via Livestream.